In our media-saturated world, we are facing an onslaught of images from different avenues of communication. When we walk through any mall or grocery stores, we are faced with a plethora of advertisements on fashion, physical beauty, make-up and other consumer products. Any magazine stand contains a huge assortment of magazines that target women in different age groups with headlines that dictate what physical beauty is according to our world today. When we turn on our television sets, surf the internet, watch movies or listen to the newest hit song on the radio, we are constantly being reminded of beauty products, dieting, youthfulness and the never-ending search for worldly acceptance. Statistics show that most individuals spend a huge fraction of their daily time on any media outlet and this opens a door for a lot of advertisements, stereotypes and destructive thought patterns that can easily enter our heads and our hearts. Eating disorders are one of the effects of our media saturated culture. Seeing exceptionally thin models on covers of magazines and televisions create an unrealistic view of the human body and sadly, many teenage girls and adult women are faced with an insecurity of their body. Current statistics show that children as young as seven are faced with a pressure to remain a certain dress size. Signs of eating disorders are showing up in younger children. Various industries spend thousands of dollars in advertisements to influence consumer attitudes and affect human perspectives into thinking a certain way that benefits their businesses. Eating disorders and insecurity about self can be a result of seemingly harmless thought patterns like compulsive exercising, obsessive dieting and/or food enjoyment, extreme focus on weight gain, physical appearance, and vanity. Thinking patterns lead to a destructive cycle where an individual starts feeling unworthy of acceptance, love, and approval by others. One mistake that we are likely to make is to trust the worldly definition of health, beauty and worth by what we see in magazines and other media items when God, our Creator and faithful Father, has loved us and has knit each one of us as a masterpiece when we were in the womb (Psalm 139:13). He knows every hair on our head (Luke 12:7) and He cares about each one of us (Matthew 10:29)! The Bible stresses the purpose of our human bodies. We were made to glorify God, and this includes our use and treatment of our bodies. 1 Corinthians 6:19-20 says that our bodies are the temple of the Holy Spirit and that we were bought with a price. When Christ suffered through a substitutionary death (taking our place) on the cross, He bought us with a price and His death and resurrection means that it was paid in full. As Christians, we are called to honor God with our bodies. Honoring God is a daily choice that we make through grace and this choice permeates every aspect of our minds, actions and heart. Having an unhealthy view of our bodies is a temptation that Christian girls might face and I, for one, am not exempt from it. There is pressure coming from all areas of our life about physical beauty and body image; but the comfort that we can share in Christ is this: (1) Our hope in Him is secure, (2) He loves us with an everlasting love and (3) while man looks at the physical and outward appearance, the Lord looks at our heart (paraphrase 1 Sam. 16:7). Another encouragement is that in Romans 12:2, God says “Do not conform any longer to the pattern of this world, but be transformed by the renewing of your mind. Then you will be able to test and approve what God’s will is – his good, pleasing and perfect will.” What counts is God’s standards and His view of us. So what does this mean for us, women of God? First, that we are called to practice discipline: we are to mentally and emotionally discipline ourselves that our worth has been decided and God says we are His special workmanship; however, we are also called to engage in physical discipline by eating in moderation and having a healthy exercise regimen. Secondly, we are called to transform our minds to focus on glorifying our Lord Jesus Christ daily. Thirdly, we are called to serve others and encourage one other in our growth and faith walk with Jesus. 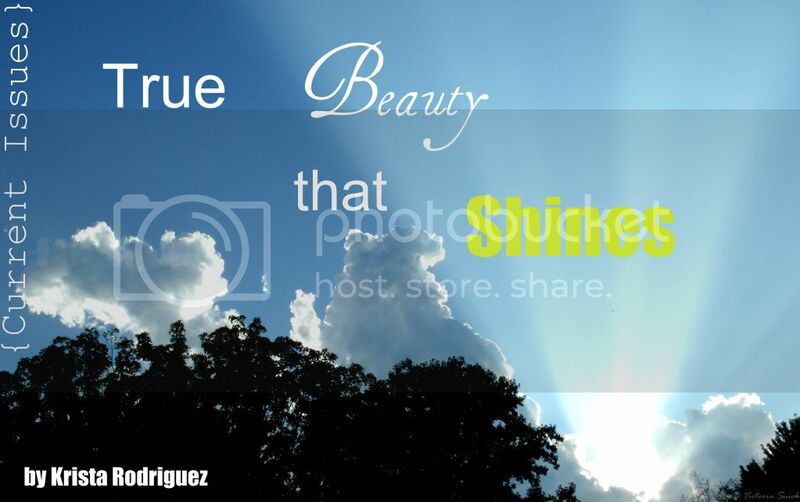 Let’s represent true beauty as God defines it in the in the Bible…because that is the only definition that counts! Let our beauty not come from outward adornment but may we be the salt and light so that people will see our good works and glorify our Father in heaven (Matt. 5:16). Dear Jesus, Thank You for Your sacrifice on the cross. Thank You for redeeming us from the bonds of sin. Please help us and guide us as we walk this earth and face the ongoing temptation to feel ugly, insecure, or unworthy. Please help us see ourselves as You see us and to renew our minds so that we are ever fixed on You and Your glory. Amen. P.S. You, reader, are beautiful! We’d love to have a conversation with you so please feel free to comment or contact us…because as sisters in Christ, we want to help each other and grow in Him! Thank you for a beautiful post about the difference between the world's version of beauty and God's version. Thank you for being such an uplifting voice for good! I read about your blog in Do Hard Things. Here is a song that goes along with your beautiful your message. Thanks!